^ "Olivia de Havilland". Encyclopedia Britannica retrieved 15 February 2013. ^ a b c "Awards for Olivia de Havilland". Internet Movie Database. Retrieved: 14 February 2013. ^ a b Thomas 1983, p. 20. ^ "Olivia Mary de Havilland at ThePeerage.com; retrieved 15 February 2013. ^ Olivia de Havilland profile at FilmReference.com; retrieved 15 February 2013. ^ a b French, Philip. "Philip French's screen legends No. 73: Olivia de Havilland." The Guardian, 31 October 2009; retrieved 9 March 2013. ^ Beeman 1994, p. 24. ^ Thomson 2010, p. 339. ^ Thomas 1983, p. 24. ^ Cornwell, Rupert. "Sibling rivalry: Hollywood's oldest feud." The Independent, 15 May 2008. Retrieved: 6 March 2013. ^ Thomas 1983, p. 25. ^ "Biography." Olivia de Havilland. Retrieved: 6 March 2013. ^ a b c d Thomas 1983, p. 26. ^ a b c Thomas 1983, p. 27. ^ a b Brown 1995, p. 125. ^ Wallis and Higham 1990, p. 86. ^ a b Thomas 1983, p. 29. ^ a b c Thomas 1983, p. 30. ^ "Results 1939 (12th) Academy Awards." Academy of Motion Picture Arts and Sciences. Retrieved: 6 March 2013. ^ "Olivia de Havilland a Citizen." The New York Times, 29 November 1941. Retrieved: 9 March 2013. 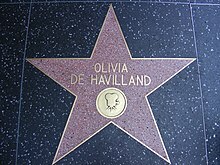 ^ "Olivia de Havilland Fast Facts". CNN. Retrieved: 9 March 2013. ^ a b c Thomas 1983, p. 33. ^ Thomas 1983, p. 153. ^ Freedland 1983, p. 172. ^ a b Thomas 1983, p. 36. ^ Belloni, Matthew. "De Havilland lawsuit resonates through Hollywood". Reuters, 23 August 2007. Retrieved: 9 March 2013. ^ a b c Meroney, John. "Olivia de Havilland is Setting the Record Straight", The Wall Street Journal, 7 September 2006. ^ Billingsley 1998, pp. 123-124. ^ Meroney, John. "Olivia de Havilland Recalls Her Role - in the Cold War", The Wall Street Journal, 7 September 2006; retrieved 17 October 2009. ^ " 'Streetcar wins film critics' nod; Voted 'The Best of the Year' by motion pictures critics." The New York Times, 28 December 1951; retrieved 8 November 2011. ^ Andrews, Emily. "Errol Flynn? He never had his wicked way with me". Daily Mail, 17 June 2009; retrieved 26 May 2013. ^ "Olivia de Havilland Biography." Turner Classic Movies; retrieved 26 May 2013. ^ a b Fishgall 1997, pp. 137-139. ^ Fishgall 1997, p. 148. ^ Honan, William H. "Marcus Aurelius Goodrich, 93, Writer Known for Naval Stories." The New York Times, 22 October 1991; retrieved 18 June 2012. ^ Eyre, Hermione. "Hollywood's sweetheart: Olivia de Havilland", London Evening Standard, 19 March 2010; retrieved 6 March 2013. ^ "Centennial Tribute to Bette Davis". Thew Academy of Motion Picture Arts and Sciences; retrieved 1 September 2013. 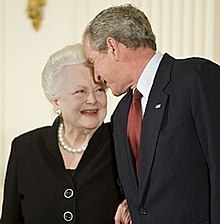 ^ "President and Mrs. Bush Attend Presentation of the 2008 National Medals of Arts." The White House Archives, 17 November 2008. Retrieved: 7 March 2013. ^ "Documentary Screening: 'I Remember Better When I Paint'." New York Daily News. 28 October 2009. Retrieved: 1 September 2013. ^ "New York Social Diary." New York Social Diary. Retrieved: 13 September 2010. ^ Kniffel, Leonard. "Film Legend Makes Memories at American Library in Paris." American Libraries, 23 March 2011. Retrieved: 6 March 2013. ^ Corbet, Sylvie. "Olivia de Havilland honored by French president." HighBeam Research, 9 September 2010. Retrieved: 6 March 2013. ^ Foster, Jodie. "Jodie Foster Opening Speech Cesars 2011." YouTube, 2011. Retrieved: 6 March 2013. ^ "Golden girl: The divine Olivia de Havilland." The Independent, 14 July 2009; retrieved 17 October 2009. Beeman, Marsha Lynn. Joan Fontaine: A Bio-Bibliography. Westport, Connecticut: Greenwood Press, 1994. ISBN 978-0-31328-409-0. Billingsley, Lloyd. Hollywood Party: How Communism Seduced the American Film Industry in the 1930s and 1940s. Ann Arbor, Michigan: University of Michigan Press, 1998, ISBN 978-0-7615-1376-6. De Havilland, Olivia. Every Frenchman Has One. New York: Random House, 1962. ASIN B000WVH9GK. Fishgall, James. Pieces of Time: The Life of James Stewart. New York: Scribners, 1997. ISBN 978-0-68482-454-3. Freedland, Michael. The Warner Brothers. Edinburgh: Chambers, 1983. ISBN 978-0-24553-827-8. Gottfried, Martin.Nobody's Fool: The Lives of Danny Kaye. New York: Simon & Schuster, 2002. ISBN 978-0-74324-476-3. Higham, Charles. Sisters: The Story of Olivia De Haviland and Joan Fontaine. New York: Coward McCann, 1984. ISBN 978-0-69811-268-1. Lamparski, Richard. Manhattan Diary. Duncan, Oklahoma: BearManor Media, 2006. ISBN 978-1-59393-054-7. Shipman, David. The Great Movie Stars, The Golden Years. New York: Bonanza Books, 1970. ISBN 978-0-31678-487-0. Thomas, Tony. The Films of Olivia de Havilland. New York: Citadel Press, 1983. ISBN 978-0-80650-988-4. Thomson, David. The New Biographical Dictionary of Film. New York: Knopf, 2010. ISBN 978-0-30727-174-7. Wallis, Hal B. and Charles Higham. Starmaker: The Autobiography of Hal Wallis. London: MacMillan Publishers, 1980. ISBN 0-02-623170-0.